The stove consists of 8 specially sized AAC cement blocks, a cast iron fire grate, and a mild steel pot holder. The blocks are tied together with pieces of wire. Bricks are arranged on the ground in the shape of a U. The AAC cement inset is placed on top of the arrangements, such that the firebox opening is at right angles with the opening in the tunnel produced by the U shaped arrangement of bricks. 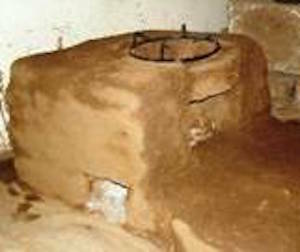 A platform of bricks and mud or bricks and cement can be built around the stove. The Bharatlaxmi Stove was designed by Appropriate Rural Technology Initiative. ARTI also conducts its own thermal efficiency testing. The stove is available for consumers in India, distributed by Samuchit Enviro Tech.